Looking for new ways to play with, er, prepare corn? Best to consult with children of the corn—you know, farm folks who grew up shucking, cooking, and eating corn since they were knee high to a grasshopper. 1. Husk the corn. Carefully remove most of the silk by hand and then rub the ears with a towel to finish the job. Slice the kernels from the cobs and place them a bowl. You should have about 2 cups. Using the back of your knife, scrape downwards along the cobs and add the milky substance that oozes out to the corn kernels. Discard the cobs. 2. 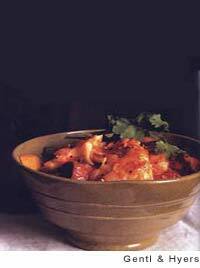 Heat a 3- to 4-quart heavy pot over low heat and add the diced bacon. Once it has rendered a few tablespoons fat, increase the heat to medium and cook until the bacon is crisp and golden brown. Pour off all but 1 tablespoon bacon fat, leaving the bacon in the pot. 3. Add the butter, onion, bell pepper, thyme, cumin, and turmeric and saute, stirring occasionally with a wooden spoon, for about 8 minutes, until the onion and pepper are tender but not browned. Add the corn kernels, potatoes, and stock, turn up the heat, cover, and boil vigorously for about 10 minutes. Some of the potatoes will fall apart, but most should retain their shape. 4. Use the back of your spoon to smash a bit of the corn and potatoes against the side of the pot to thicken the chowder. Reduce the heat to medium and season the chowder with salt and pepper. Stir the cornstarch mixture and slowly pour it into the pot, stirring constantly. 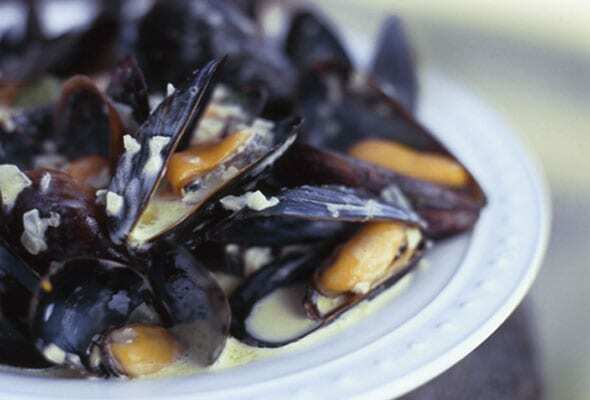 As soon as the chowder has come back to a boil and thickened slightly, remove from the heat and stir in the cream. Adjust the seasoning if necessary. Serve immediately or et it sit at room temperature for up to an hour, allowing the flavors to meld. 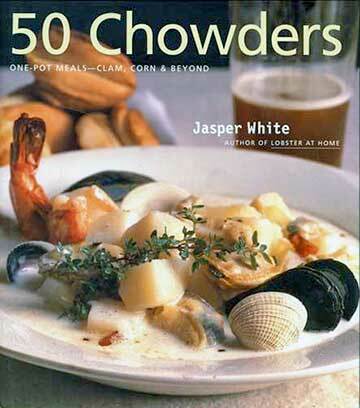 If you are not serving the chowder within the hour, let it cool, then cover and refrigerate for up to a few days. Reheat the chowder over low heat and do not let it boil. 5. Ladle the chowder into cups or bowls and sprinkle with the chopped chives. 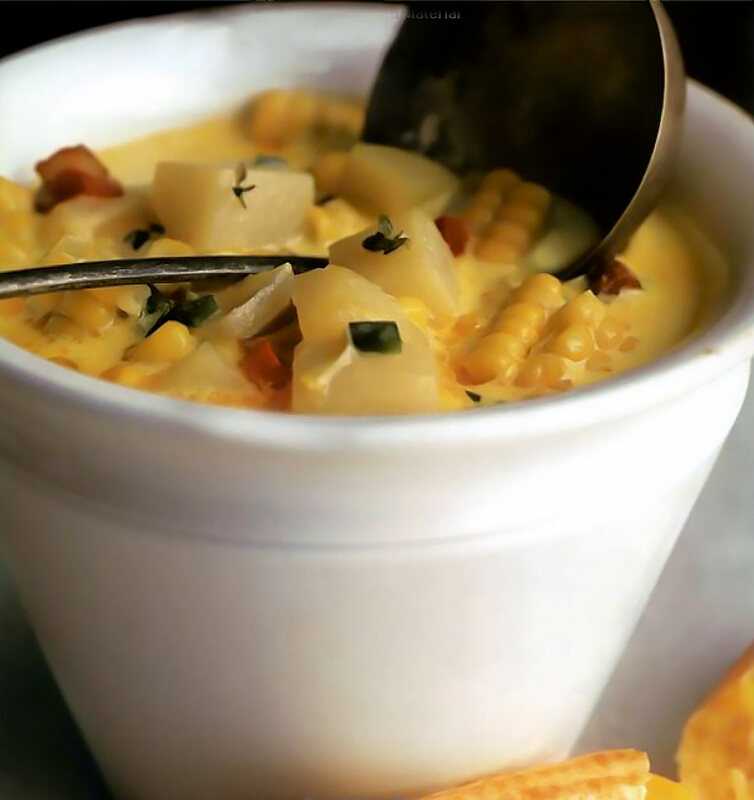 Corn Chowder Recipe © 2000 Scribner. Photo © 2000 Gentl & Hyers. All rights reserved. All recipes and photos used with permission of the publisher. This soup is superb! It’s incredibly hardy and filling. The recipe is very easy to follow. I like that the weights are given for the onion and pepper. (Oftentimes in a recipe, 1 small onion is required, for example, and this could mean different things for different cooks.) The ingredients are all readily available. The turmeric gives the soup a beautiful yellow color. The flavors meld together so well; the next day the soup was even better! Perfect meal-type soup, especially when accompanied with a piece of crunchy bread. This takes a little prep work but is well worth the time to get everything ready. I did have a little trouble finding slab bacon that wasn’t sliced, but I’m glad we finally found some. It’s a little difficult to mash the corn kernels on the side of the pot. Corn is just funny that way, it wants to stay like it is. The end result is a very nice, thick chowder with the right mix of flavors. You’ve the smoky flavor of the bacon, the creamy texture of the potatoes, the slight crunch of the corn, all brought together with cream. What could be better? Even the little ones came back for more of this one. My first attempt at corn chowder and I’ll be making this for years to come. I couldn’t find slab bacon, so I used thick cut and it worked well. Served it with a small salad and made a wonderful dinner.